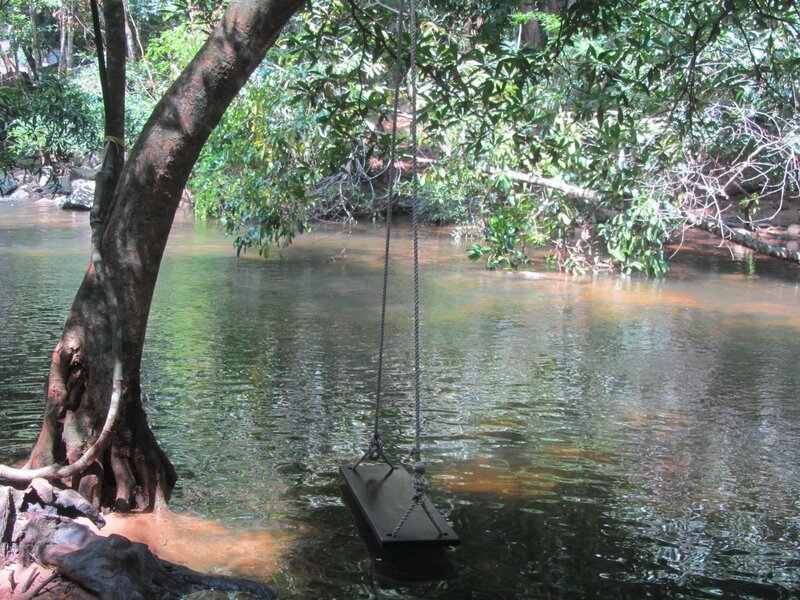 The La Nga River and Thac Ba Waterfall offer freshwater bathing, lush jungle, mountain scenery and opportunities for camping, all within a few hours’ drive of Saigon. A great inland escape for city-dwellers, these two pretty spots are best visited with your own wheels, either as a short loop from Saigon or as part of a longer tour of the region. New roads have made this area more accessible than ever. A trip here is a great alternative to more well-trodden inland natural attractions within easy reach of Saigon, such as Cat Tien National Park. 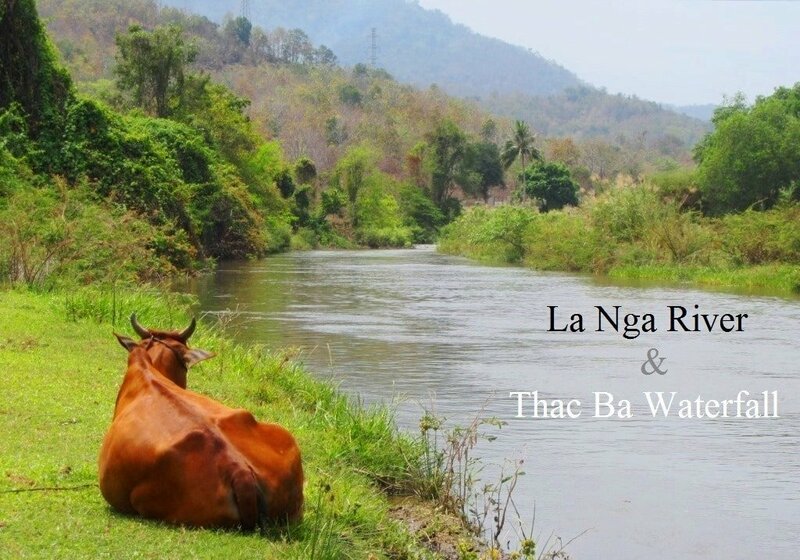 On this page, I’ve written a brief overview of the La Nga River and Thac Ba Waterfall. 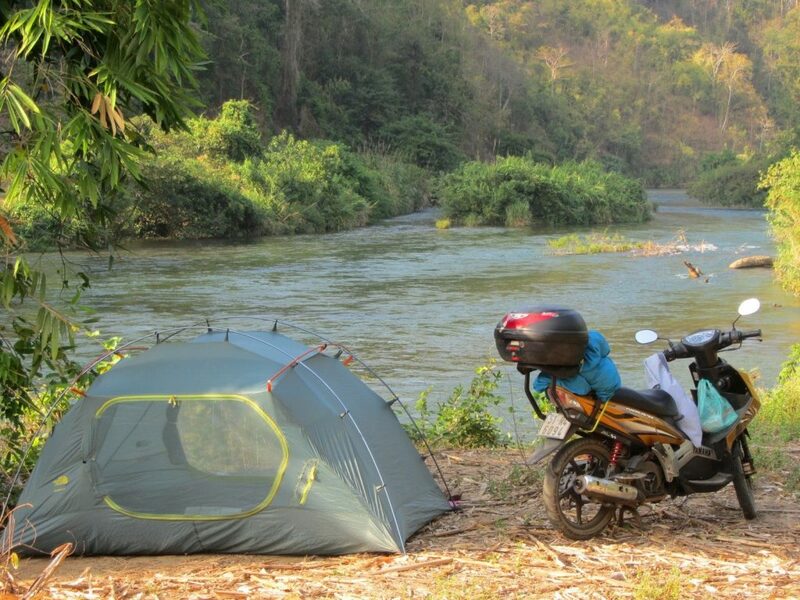 If you’re not planning to camp by the La Nga River, there’s accommodation in the form of several nhà nghỉ (local guest houses) in the nearby towns of Lac Tanh (Tanh Linh) and Ta Pao. Alternatively, continue up to the hotels in Bao Loc, or to Di Linh for a night at Juliet’s Villa Resort. I assume that anyone intending to travel to the La Nga River and Thac Ba Waterfall will do so with their own wheels (motorbike, bicycle or car), so I have drawn a map of the best way to get there from Saigon (i.e. the most scenic and least traffic-clogged). Note: There are many excellent ways to extend this route and create a longer tour of the area. You could, for example, continue south on Route QL55B to the coastal town of Lagi and check out some of the campsites on the Ocean Road; or north on Route QL55 to Bao Loc and on to Dalat using my back-roads guide; or head west to Cat Tien National Park; or follow my Inland Binh Thuan or Tet Lunar New Year routes. 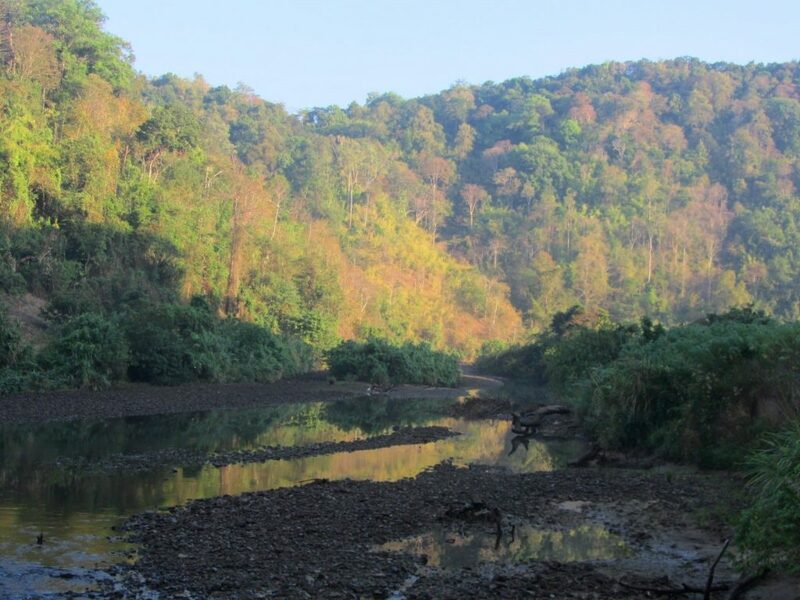 Cool and clear, and surrounded by lush highland scenery, the La Nga River offers opportunities for wild swimming in its refreshing waters and wild camping along its pretty banks. This is very rare considering it’s within such easy reach of Saigon. Just 170km east of the city (a journey made much easier, and far more pleasant, than in the past thanks to new back-roads), the La Nga River is a great way to escape to the countryside for a couple of days. One spot in particular is easy to access and very beautiful. Near the minority hamlet of La Ngau on Route QL55, a bridge crosses the La Nga River. At either end of the western side of the bridge, dirt roads lead along both banks of the river. Follow these and you’ll find some fabulous bathing and camping spots. You could easily spend the day (and night, if you have a tent) along the banks of this river. The further down the dirt paths you go, the rougher the surface and the more remote and pretty the scenery becomes. Bring some picnic food and drink, find a nice shady spot and while away the day. Ethnic minority communities live in bamboo stilt houses surrounded by cashew orchards, just back from the river. The locals will likely come and say ‘Hi’ as you picnic by the river. Note that, although swimming is good, the current can be strong. It all depends on what’s happening upstream, where the Da Mi hydroelectric dam controls the water flow. Be very careful, even if you’re a confident swimmer. The dramatic change in water level, depending on the dam, is also an important factor to consider when choosing a campsite: if the dam is closed, the water level will be low, and what may look like a perfect river beach for camping, will be a metre under water once the dam is opened and the water level rises. Make sure you camp above the high-water line. 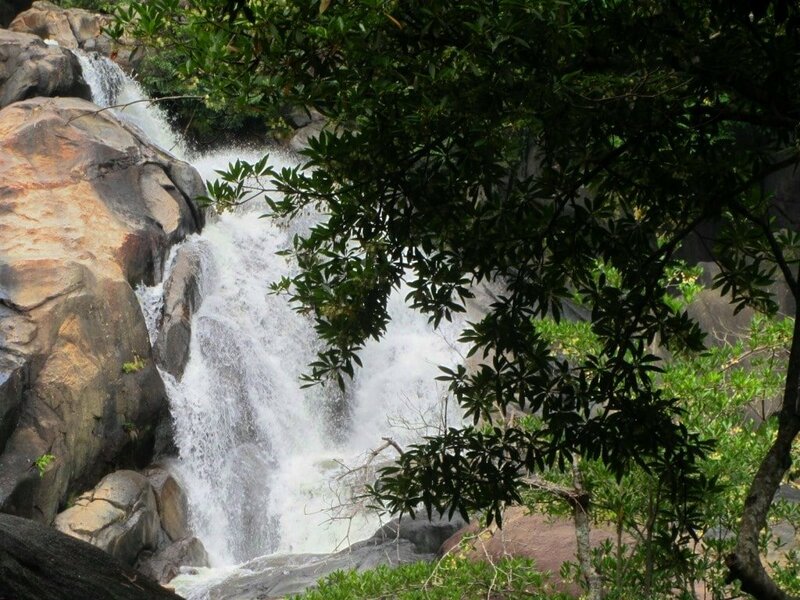 Thac Ba is an attractive cascade of white water tumbling over large granite boulders covered in jungle vines. It’s a beautiful place, but it can get crowded with domestic tourists and, predictably, tainted by trash. 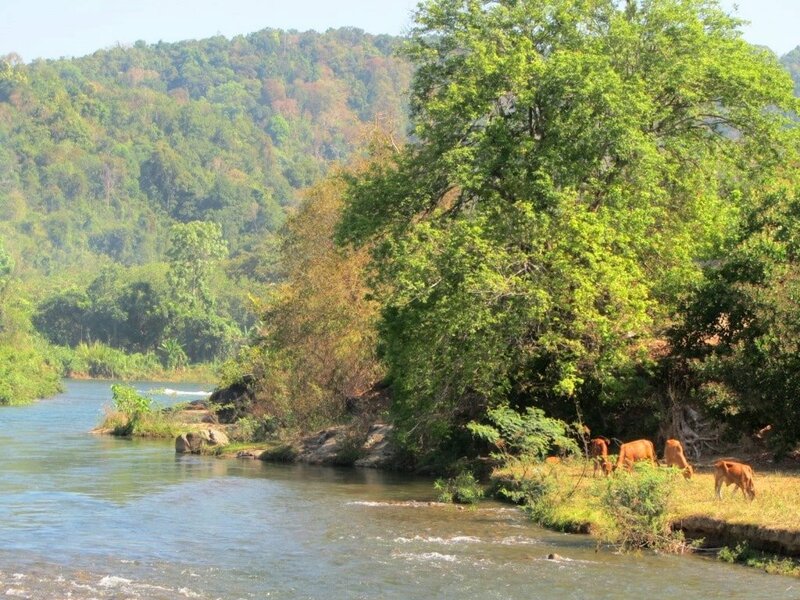 The ride from La Nga River to the falls, on Route QL55, is very pretty, passing rice fields in the shadow of forested hills before reaching Lac Tanh (Tanh Linh) town. A paved lane (signposted to the falls) leads south of town towards the jungled slopes of Nui Ong Mountain. You can drive as far as the entrance gate (parking: 10,000vnd; entrance: 25,000vnd; open: 6am-6pm), from where a beaten-up, doorless old minivan ferries visitors up a pathway, through towering tropical trees and screaming cicadas, to the foot of the falls. The water crashes over boulders, then rocks, then stones, then pebbles as it bursts forth from the dense jungle foliage on the mountainside. It’s not especially high, but it’s still a very impressive and scenic sight. 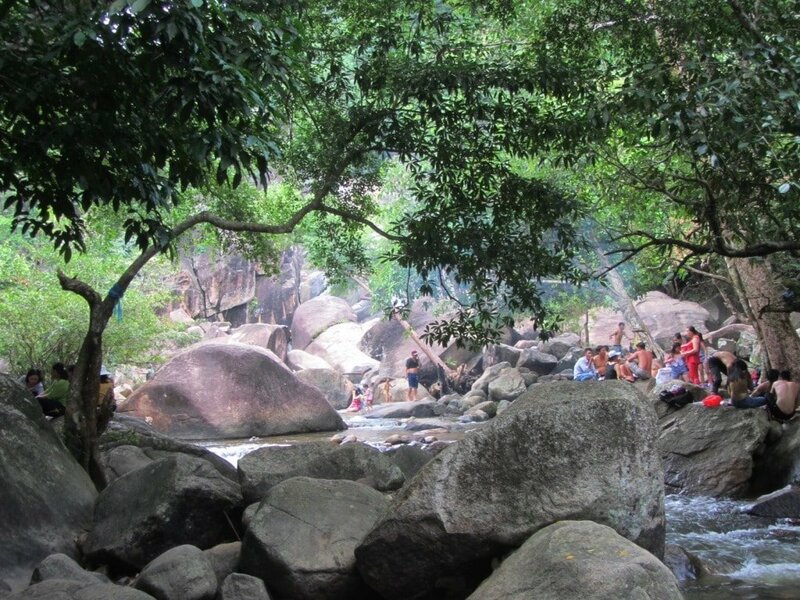 There are often large groups of Vietnamese visitors – families, friends, school children – jumping from the rocks into the cool water, swinging in hammocks between trees, drinking beer by the shady rock pools, grilling marinated meat over fires made between boulders, and having an all-around great time. It’s what Vietnamese groups do best: food, drink, family and friends in a beautiful natural setting. Unfortunately, when it comes to cleaning up after themselves, no one seems to bother. Thus, there are piles of picnic trash jammed between rocks and strewn all over the place. Some people do make an effort, and there are staff at the waterfall who seem to pick up some of the trash, but it’s a losing battle. There are a couple of restaurants and cafes by the falls which serve pretty good food and drink. Alternatively, head back into Lac Tanh town for a meal of nem nướng (roll-it-yourself rice paper parcels filled with grilled pork and herbs). 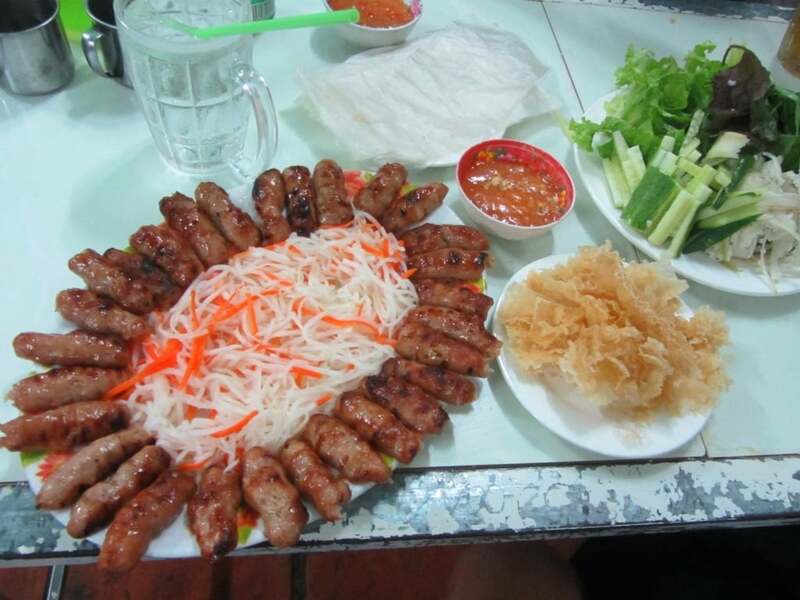 There are a few restaurants selling nem nướng on road DT720 as it passes through town. Several doors down from the restaurants, Nhà Nghỉ Minh Hoa (0623 880 256) is a decent local guesthouse with simple but clean rooms for 150,000-250,000vnd. This entry was posted in ALL, Camping, Central Highlands, DESTINATIONS, MOTORBIKE GUIDES, Mountains, Mountains, Near Saigon, Off Beaten Path, The South, The South, Waterfalls and tagged Binh Thuan, camping, guide, thac ba, travel, Vietnam, waterfall. Bookmark the permalink. The thing is we are travelling with 3 kids (10, 7 and 2 years old) and we need to travel in there needs and pace. (We are also considering Mekong Delta and a Farm visiting and Chu chi channels – been looking at les rives trips) – and we have also thought about hooking up with a local guide for a few days who could combine the different trips for us. Cat Tien is probably OK with children. The guide to the La Nga River and waterfall on this page is probably not such a good idea with children, for a number of reasons: the falls and river can be quite unpredictable and the trip in general is best on your own wheels. In the Mekong Delta I highly recommend Susan Tours – it’s worth contacting her to see what she can do: contact her via Facebook – Can Tho Touring with Susan. Les Rives is a good option, too. Thanks so much for this awesome guide! I did this with my fiance last weekend and we had a blast. We got up at 6am & left HCMC on a Saturday, making good time across the ferry. We stopped around brunch time in Long Khanh and got some pho near the war monument in that area. Then we got to about Vo Xu (on your map) where we could have gone the northward or southward route, and realized that it would be too much to try to hit the river and the waterfall in one day. We ended up going southward towards the waterfall and arriving around ~2pm. Your description of the minivan is spot on. They’re developing the site a bit & were constructing a stage area when we were there. The trash was not too bad, especially if you go to some of the upper pools. Even though there were a number of people, the site is spread out enough that we felt like we had enough space for ourselves. We stayed about an hour and left for Rock Water Bay Beach Resort in La Gi which was super nice. We took QL55b there and the road is in pristine condition; we encountered no trucks and very few other motorbikes. We were able to find a last-minute room there for ~1,050,000 VND, which we thought was pretty good value considering they give you this “super king bed” made of 2 double beds pushed together. The only downside was that since it was overcast (great for driving!) their solar water system was out of water. So we did not get any hot water. However, the salt water pool was well maintained, and they have some jacuzzi’s in that area that they will turn on for you free of charge. Since the beach is inaccessible at high tide, at low tide it is very clean / easy to enjoy, especially in the early morning. I saw you recommended Anh Duong Resort here (http://vietnamcoracle.com/the-ocean-road-saigon-to-mui-ne-2/) as a cheaper option but their website doesn’t seem to be working, you may wish to revise the recommendation if they are no longer there! Anyways, thanks again for the incredibly detailed maps & great recommendations! We definitely would not have made it out there if not for this guide. P.S. – as you say in a comment thread above, doing this in 2 days is a bit rushed. We left early-ish (10am) on sunday, but if we had left 1-2 hours later we would have hit bad sunday traffic coming back to Saigon. Next time I’d follow your advice of continuing on to bao loc and staying a night there. Good to hear you enjoyed your trip – sounds like a lot of fun, if a bit rushed. Thanks for sharing your experience and for the updates. I hope you get a chance to go on another similar trip soon. I came here intending to write a comment, only to realise James already wrote a very detailed one 6 moths ago with similar information I wanted to mention! He proposed to me on a whim when we were at the resort – so double thank you for such a great review. We had a wonderful time and made beautiful memories. Please continue to write great reviews and recommendations! How long would you say you need to do this trip? Seems like three would be ideal so you don’t feel too rushed, or would that be too much time spent there? Love your blog. You keep writing, I’ll keep reading. Yes, 3 days would be perfect. Two is fine too but you’d be a little rushed. I hope you enjoy exploring this area. I always enjoy your news letters and this one is no different – thanks! I visited Vietnam last November and did the northern loop through the mountains by motorcycle. Then flew to Na Trang for some coastal riding. The thing that disappointed me and you mentioned it in this article was the amount of trash and general lack of concern the people seem to have for their environment. I looked forward to swimming in a river or the ocean but was put off by the amount of debris. I would like to travel the central highlands from Hanoi to Saigon someday but the trash thing is troubling. I know these folks work real hard just to get by, but hopefully they will realize the extent of this issue and take some action. It’s such a beautiful country! 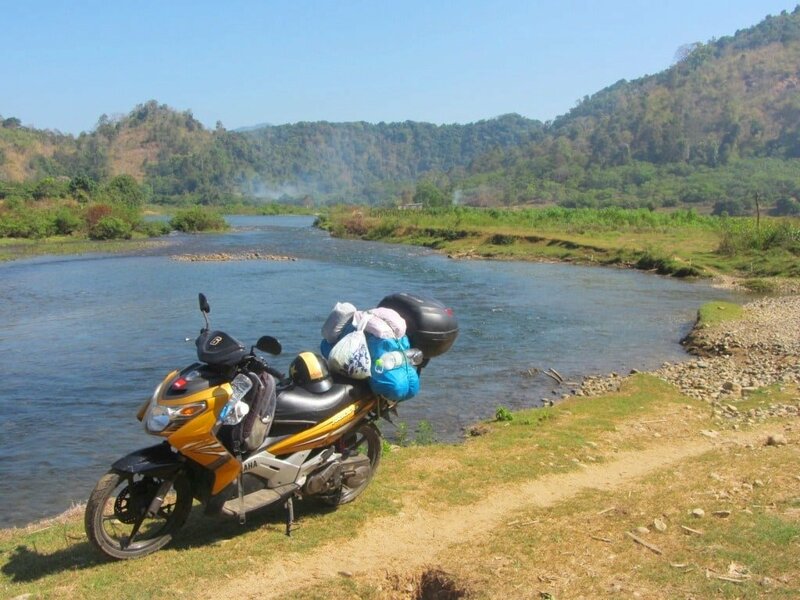 We are getting ready to start planning our next adventure ride and are looking at Laos as a possible, we have done Thailand and Cambodia previously. Great to hear that you enjoyed your trip through Vietnam, but yes the trash is becoming a huge problem now. It’s quite a complex issue, of course, but it’s difficult not to get depressed about it, however I’m still optimistic that things will start to turn around soon. I’ve written in more detail about the issue here if you’re interested. I hope that you will find some ‘un-trashed’ places to swim and relax on your next visit to Vietnam.